I’m not a college graduate. I went to probably five colleges, and I dropped out of them all. I have ADD. I didn’t come from money. But you don’t need a lot of money to be a real estate investor, and that’s what I teach people. I did my first big real estate deal on land—and I did it without using my own money. Today, my mantra, my message, is that anyone with the desire and work ethic can get started in real estate without much money. I’m a real estate entrepreneur, an A&E network TV star, a Trophy Truck racer and a charitable catalyst. My first real estate investment was at age 14, and I never looked back. My career has moved into land development, buying-and-holding, real estate flipping and diversifying my portfolio as the years have gone by. Today, Amie and I have the kind of personal freedom we once only dreamed about. In a world seemingly full of reality-TV flipping posers and self-proclaimed “experts” who have minimal experience, you can trust us as two people who’ve not only “been there, done that,” but we’ve done it with amazing success. We’re thrilled to share our winning formulas with you! As passionate as we are about real estate, we’re just as passionate about paying it forward. We find time to to give back to the community, and now spend a great deal of time helping others get started. You can see it in our student’s success! The most powerful asset in your quest for personal freedom is knowledge. 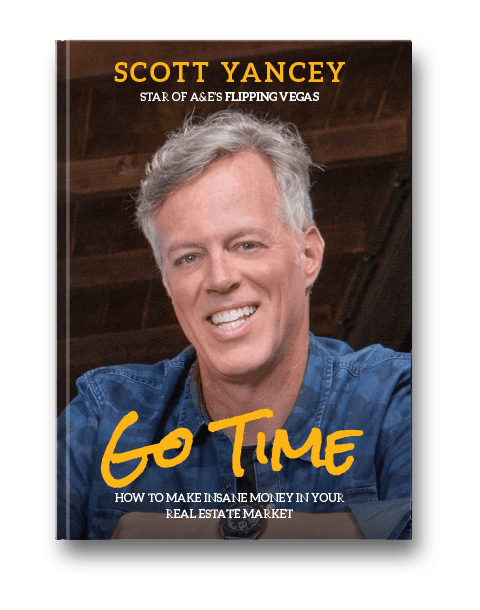 I’ve shared some of my secrets to success in real estate in “GO TIME.” Sign up below, and I’ll send you the first chapter INSTANTLY. © 2018 Scott Yancey and Affluence Edu. All rights reserved. Affluence Edu, its parents, subsidiaries, and affiliates is a direct-to-consumer real estate training and education company. We do not sell a business opportunity, “get rich quick” program, or money-making system. We believe, with education, individuals can be better prepared to make investment decisions, but we do not guarantee success in investing. We do not make earnings claims, efforts claims, return on investment claims, or claims that our training will make you any money. Training generally includes a hybrid of education, training, and tools/resources. All material is intellectual property and protected by copyright. Any duplication, reproduction, or distribution is strictly prohibited. Training and education for Scott Yancey’s events are provided by his education partner, Response. No affiliation with or endorsement by A&E Television Networks, LLC.